Another added service to which we playfully call EgoTrip "Travel." More specific, I‘m a Certified Sandals Specialist and now offer our couples Honeymoons and WeddingMoons at any of the Sandals, Beaches and Grand Pineapple Resorts. That‘s why a Sandals tropical honeymoon is the kind of honeymoon you dream about. Only Sandals offers the ultimate honeymoon locations for all-inclusive honeymoon packages in the Caribbean, with luxurious accommodations and the best land and water sports - from golf to scuba, and an array of top gourmet dining options. The best part... our romantic honeymoon vacations are all-inclusive. So leave your worries and wallet behind and spend your honeymoon dedicated to each other. Delight in a delivery of a decadent breakfast in bed one morning of your choice. To qualify for the all-inclusive Caribbean Honeymoon Package, all you have to do is check-in online after booking your honeymoon. Offer valid for travel within 30-days of your wedding date. 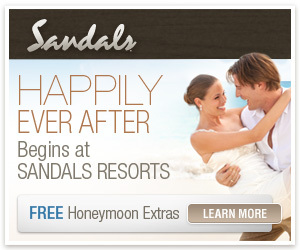 There‘s nothing that thrills us more than matching you to the perfect Sandals for your dream destination wedding. With 15 Sandals in 6 different exotic locales, it‘s easy to find the Luxury Included® destination that‘s just right for you! So romantic, so exotic and nestled in the most beautiful settings, we had to name them "Love Nests." Defined by exclusive amenities and unique designs for heavenly seclusion, these luxury suites and villas in the Caribbean create the ultimate escape for love birds. Our Caribbean Islands boast some of the most stunning beaches in the world - but we know we‘re way more than sand and sea. We know our islands intimately and are ready to let you in on all the secrets that paradise has to offer with our own hand-picked adventures.